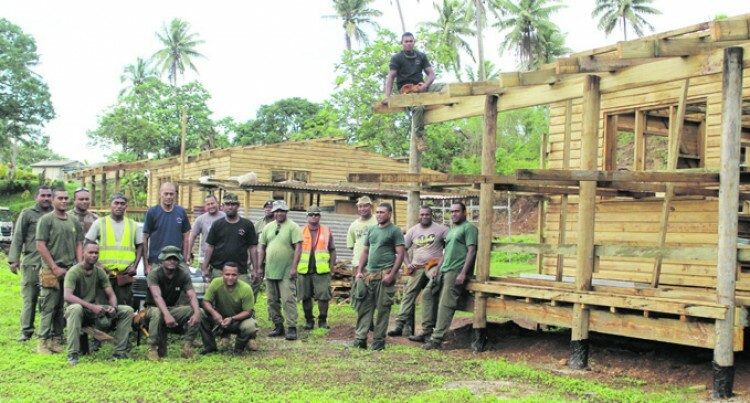 Work on projects conducted by the Republic of Fiji Military Forces (RFMF) engineers are ongoing despite the shortage of some building materials. Team leader, Warrant Officer Class 2 (WO2) Joji Malodali said their work continues despite this affecting their progress on two projects in Tailevu. At Namalata District School in Korovou, Tailevu North, 20 engineers are constructing six teachers quarters. The timeline is 70 days for one to be completed. “If the building was not completed within 70 days, we will have to make another request for extra rations. This does not happen as we make sure projects are completed before the time line,” he said. “We can do it but some building materials had not arrived. The two buildings should have had their roofs on but we are waiting for two materials before we can place the corrugated iron roofing on. He said the six teachers’ quarters would be constructed to withstand a category five cyclone. He also said they made changes to the plan to make the building stronger. Children from Matacula, Matacaucau, Navunisole and Nailega attend the Namalata District School. It is a feeder school to Tailevu College. Meanwhile, 20 engineers are also constructing a kindergarten and a teacher’s quarter at the Nasemira Primary School, Tailevu South. Assistant team leader Corporal Isimeli Saukitoga said work on the kindergarten costs $120,000 while the teacher’s quarters was $90,000. “The kindergarten building should have been completed but some building materials were still to arrive,” Corporal Saukitoga said. The kindergarten caters for children from Kiuva, Muanaira, Nasilai and Vadrai. The RFMF engineers are camping at the school. The team has a plumber and an electrician. On Wednesdays, the villages prepare them lunch. Villagers also assist the engineers but WO2 Malodali said they just help in cleaning up after their work. They also supply the engineers with root crops and vegetables.